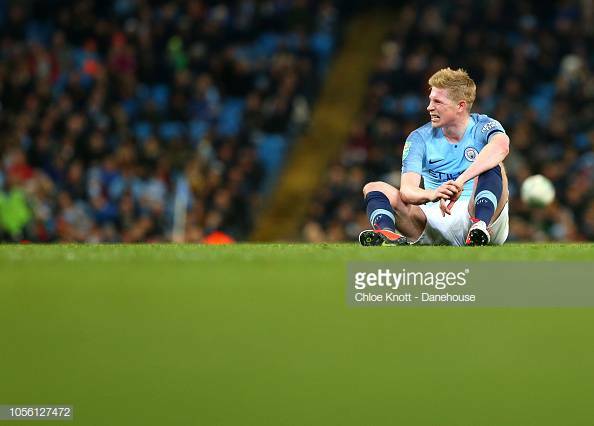 Kevin De Bruyne was making only his second start this season after suffering ligament damage in his knees during training with the club in August but disaster struck again as he combated for possession with Manchester United loanee Timothy Fosu- Mensah. The Fulham player fell over on De Bruyne's knee and the Belgian ace had to be taken off and he headed straight down the tunnel to complete necessary checks. It comes as a huge blow for City just a week prior to the big match at home against sworn cross-city rivals United. In his press conference today, boss Pep Guardiola said: "Unfortunately he is injured but fortunately he will come back in four to six weeks," before adding: "He was so sad. But today less sad and tomorrow he will be stronger again. He can spend time with his family, then it's international break and then he will be back." Guardiola went on to add that De Bruyne's previous knee injury was more "dangerous" than this one and that he's more concerned about muscular injuries than traumas/impact injuries. He is expected to miss the Premier League fixtures versus Southampton, Manchester United, West Ham, Bournemouth, Watford and also the Champions League matches against Shakhtar Donetsk and Lyon. Although not confirmed yet, City could target a return for the Premier League game away at Chelsea on 8th December as they try to keep the opposition at arm's length in their campaign for a first successive title. De Bruyne was heavily influential as City won the Premier League last term, but have shown they can cope without him this season. The playmaker has played just four times but in Bernardo Silva, City have found a player more than capable of deputising for the Belgian.